Lees Ferry is in the colorful, relatively open valley of the Colorado River (fig. 1) down- stream of Glen Canyon and upstream of Marble Canyon, which is the beginning of the Grand Canyon of the Colorado River. The Paria River, an important tributary, enters the Lees Ferry area through Paria Canyon (fig. 2). Geologic mapping was undertaken to provide information about the age, distribution, and origin of surficial deposits in the near-river environment. Information about recent geologic activity is necessary to understand the rates, magnitude, and processes of environmental change along the river today. This information is also needed to evaluate the consequences of regulated streamflow, which began in 1963 with closure of Glen Canyon Dam (27 km upstream of the map area). The dam controls flooding and cuts off the supply of sediment. The resulting essentially clear water flows are erosive in a river system formerly adjusted to a large supply of sandsize sediment. These regulated flows have the potential to erode and damage the riparian environment, including near-shore archeologic features. The map shows the present configuration of pre- and post- dam geomorphic features. This map information is a baseline against which future change resulting from natural causes and regulated streamflow can be measured. The Lees Ferry area is important geologically, culturally, and politically. In terms of surficial geology, the late Quaternary deposits shown on the map record the physical effects of environmental change on the Colorado River, the Paria River, and the relatively small tributaries draining the rim of Glen Canyon. Four types of surficial deposits are important in the landscape of the area: (1) gravels in high level, abandoned, channels of the Colorado River that were deposited during the late Pleistocene, probably in response to glacial activity in the Rocky Mountains; (2) terraces related to accumulation of sand in the channels of the Colorado and Paria River, resulting from changes in streamflow and sediment load; (3) debris- flow deposits at the mouths of relatively small tributaries that form bouldery fanlike surfaces; and (4) late Holocene flood deposits of the Colorado River that were laid down by unusually large floods. These prehistoric floods were substantially larger than the largest historic flood of July 1884, on the basis of the elevation of the deposits above the historic-age flood deposits. The Lees Ferry area has a long and rich cultural history discussed by Rusho and Crampton (1992) and Reilly (1999); important historical sites in the map area are identified and described by Thompson and others (1995). Located between two virtually uncrossable canyons, Glen Canyon and Marble Canyon, this area has been a Colorado River crossing since prehistoric times, even though crossing requires swimming at most river levels. The older river terrace shown on the map was used by prehistoric peoples for camping, probably close in time to fording the Colorado River, as indicated by shallow hearths and other archeologic features. The first written description of the area is the Dominguez- Escalante Journal (Chavez, 1976, p. 93–95), an account of an expedition through the Southwest in 1776. The expedition camped on the banks of the Paria River near the former junction with the Colorado River (fig. 2) from October 27 to November 1, 1776. In late 1871, the now abandoned ferry crossing (on the debris fan near the east boundary of the map area) was established by John D. Lee who also settled Lonely Dell Ranch (north of map area). In modern times, the area is important for recreation including sight seeing, hiking, fishing, and as a launching point for whitewater raft trips through Grand Canyon. Several of the mapped deposits accumulated since the area was visited by the Dominguez-Escalante Expedition. The geopolitical boundary or Compact Point between the Upper and Lower Colorado River Basin is in the Lees Ferry area. A compact drawn up in 1922 allocates water among the seven states (Wyoming, Colorado, Utah, New Mexico, Arizona, Nevada, and California) receiving water from the upper and lower basins. To appropriate water, gaging stations that measure streamflow and sediment load were established on the south bank of the Colorado River and on the Paria River about 1 km north of the map area. Changes in streamflow at the gaging stations are described by Andrews (1990; 1991). The long term streamflow patter ns reveal important environmental changes of the 20th century, including arroyo cutting, drought, and the effects of Glen Canyon Dam. Ground control for photogrammetric construction of the topographic base map was done by the Surveying Team of the Bureau of Reclamation, Glen Canyon Environmental Studies (GCES). The deposits were mapped in the field using low-altitude (scale 1: 4800) color aerial photographs taken May 30, 1993. The aerial photographs are numbered GCES 10–6 to 10–8 and 11–1 to 11–8. The geologic information was compiled on the base map using a stereo analytical plotter. The dates of the alluvial deposits were deter mined from dated archeologic remains, historic photographs, content of driftwood, and ring counts of living trees related to deposition of the alluvium. In addition, the terrace sequence in the Lees Ferry area is similar to a dated terrace sequence in eastern Grand Canyon and Marble Canyon (Hereford, 1996; Hereford and others, 1993; 1996a; 1998), which permits correlation with the dated alluvium. Debris- flow deposits in the map area were subdivided on the basis of the degree of sur face weathering and darkness of rock varnish, which was deter mined using the method of Bull (1991, p. 63–64). Varnish darkness was used to estimate the date of the debrisflow surface on basis of comparison with varnish darkness from dated debrisflow surfaces in eastern Grand Canyon and Marble Canyon (Hereford and others, 1996a; 1997; 1998). 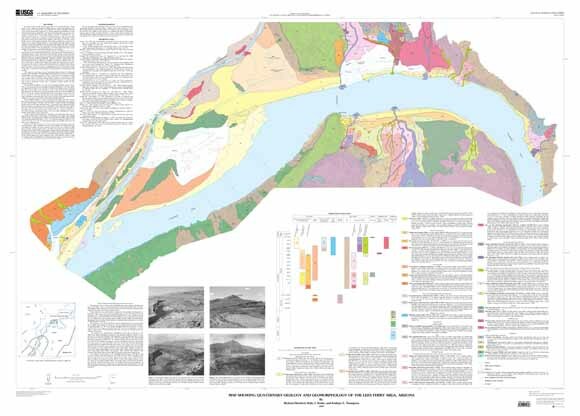 Hereford, R., Burke, K.J., and Thompson, K.S., 2000, Map showing Quaternary geology and geomorphology of the Lees Ferry area, Glen Canyon, Arizona: U.S. Geological Survey Geologic Investigations Series I–2663, scale 2,000, available at https://pubs.usgs.gov/imap/i2663/.